You should be able to design the line chart in the way YOU want. 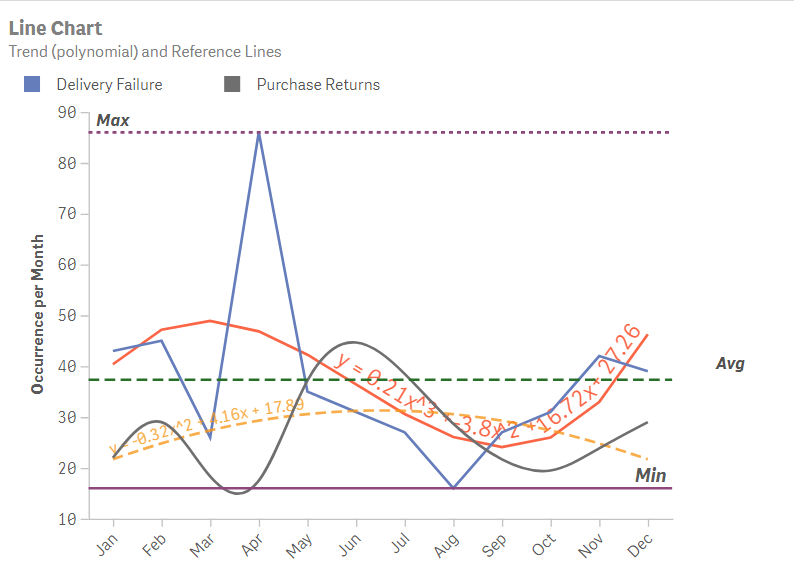 Unlimited possibilities with the Vizlib Line Chart allow you to focus on what you are best at: creating compelling visualizations and dashboards without writing a single line of code. Open Qlik Sense and add the 'Vizlib Line Chart' extension to a sheet. 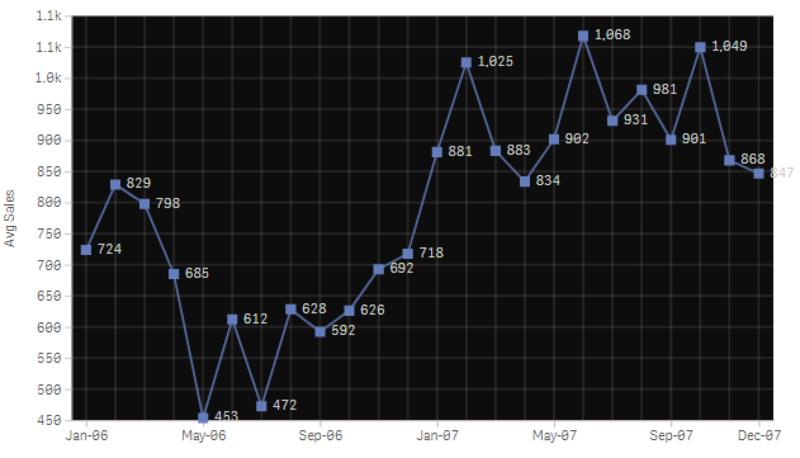 Fully customisable Multi-Line Chart with rich formatting options. Wide selection of data point representations, from symbols to images. Split totals by a second dimension represented by a Pie or Donut Chart. Option to accumulate metric values over the x-axis. 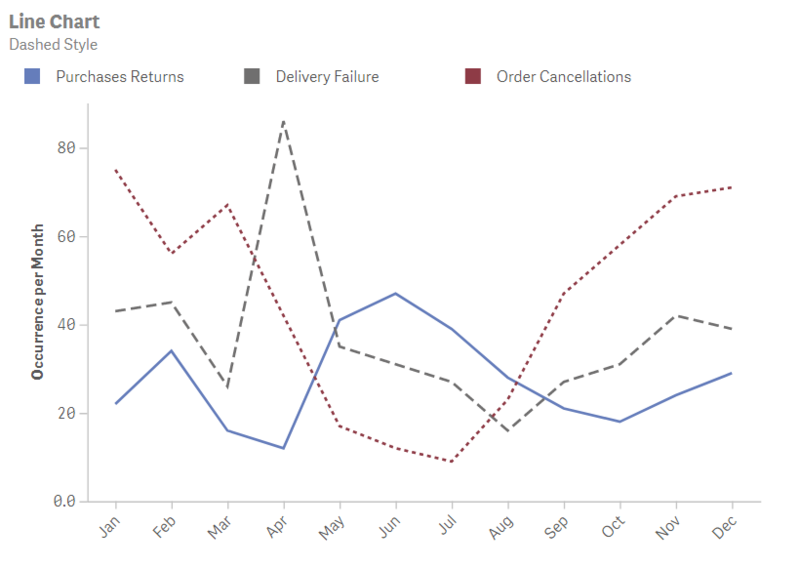 The Vizlib Line Chart supports either one dimension with multiple metrics or two dimensions with one metric. 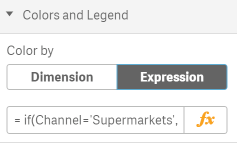 All settings related to the dimension are located in the Appearance section. The Vizlib Line Chart supports up ten metrics if one dimension is selected, or only one metric if two dimensions are chosen. Show/Hide the metrics based on a calculated condition. Choose the axis (left/right) against which the metric should be plotted against. Using multiple axis allows visualising multiple metrics of different magnitude on the same line chart. Use markers or image to visualise the data points on the line chart. 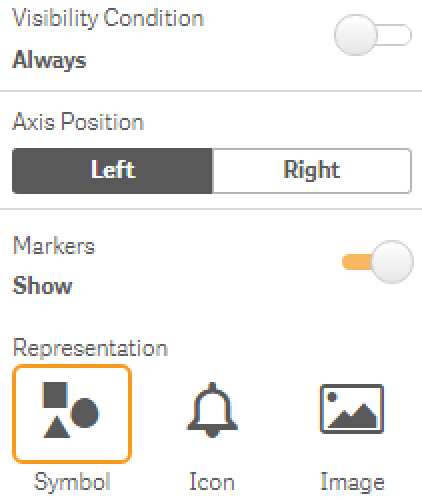 Use either a online URL or upload your image using the native Qlik Sense content editor. Choose the line chart color. If no specific line chart color is chosen, the custom color palette is used. Choose between dotted, dashed or normal line styles. Set the opacity of the line. This is especially useful when you are using markers and you wish to put the line in to the background. Same as with the Line Opacity, but applicable to the area of the line chart, if Area Chart is chosen as the presentation. This option determines whether the metric is accumulated over its x-Axis. This is particularly interesting if the x-axis is a time dimension, and you wish to display the aggregated totals over time. 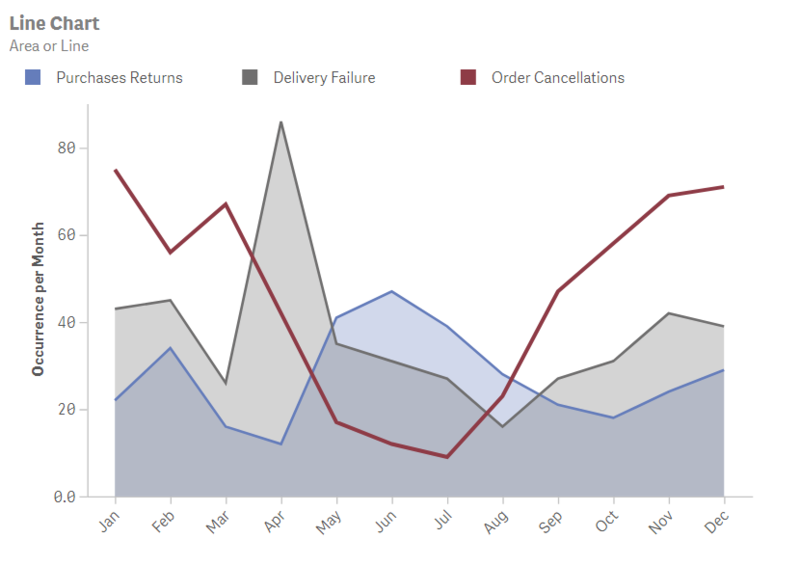 The Vizlib Line Chart supports show zero values and a calculation condition. 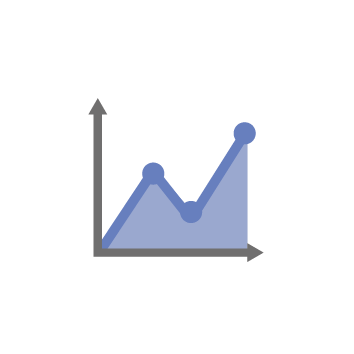 This section describes the various formatting options the user has when using dynamic reference lines in the Vizlib Line Chart. Set the reference value – expression can be used here. Set against which axis (left/right) the reference line will be plotted against. 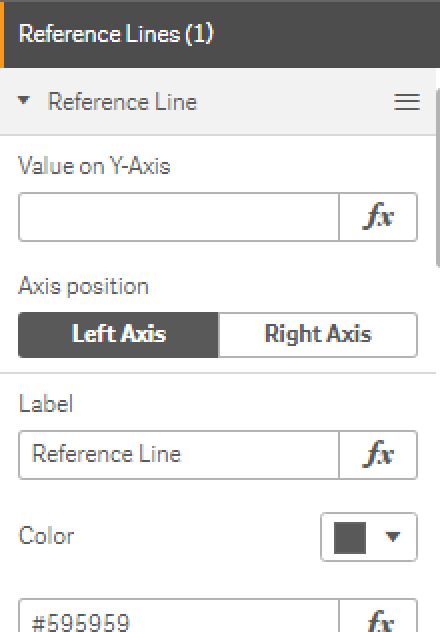 Give your reference axis a label which will be place on top of it. Place the label either to the left, to the center, or to the right. Choose the line Color of the reference line. Choose the line width of the reference line. Decide whether the reference line should be dotted, dashed or normal. Choose whether you wish to use stripes in the background or rather stick to a fixed color. If stripes are chosen, decide whether they should be displayed horizontally or vertically. Choose the primary color of the stripes. Choose the secondary color of the stripes. 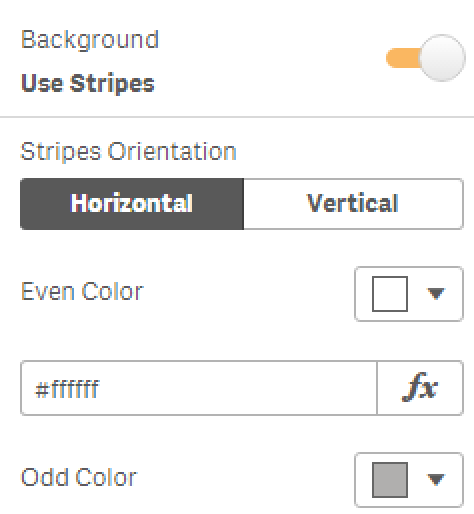 If a fixed background type is chosen, you can here choose the color. Choose between displaying the dimension title as bold, italic or underlined. Set the thickness of the x-Axis line. Display the second dimension as segregated lines. 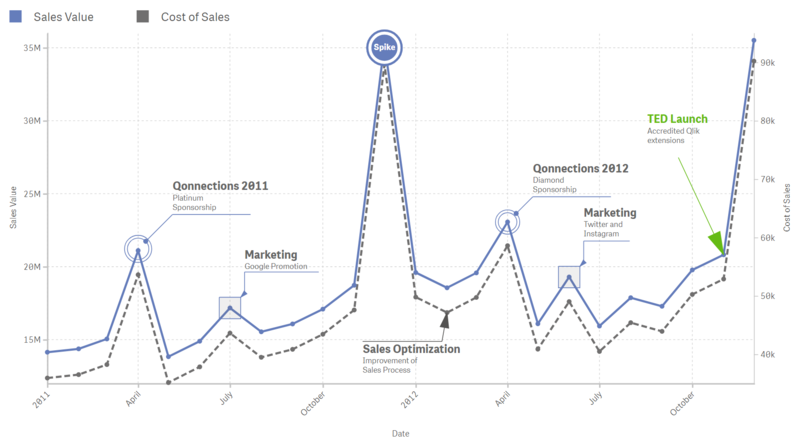 Most utilized presentation in a Line Chart. This allows you to split the totals into mini pie charts. The Radius setting controls the size of the pies in pixel. This allows you to split the totals into mini donut charts. 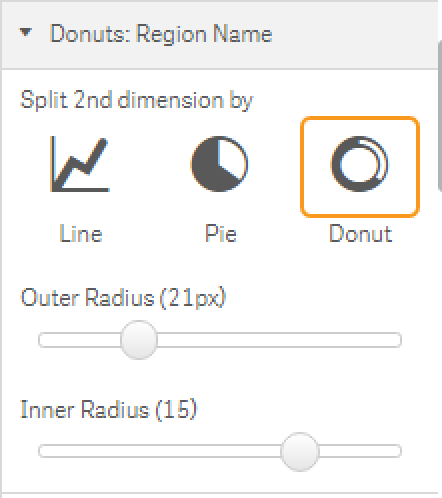 The Outer/Inner Radius setting controls the size of the donuts in pixel. You have got the freedom to choose your own collection of colors. 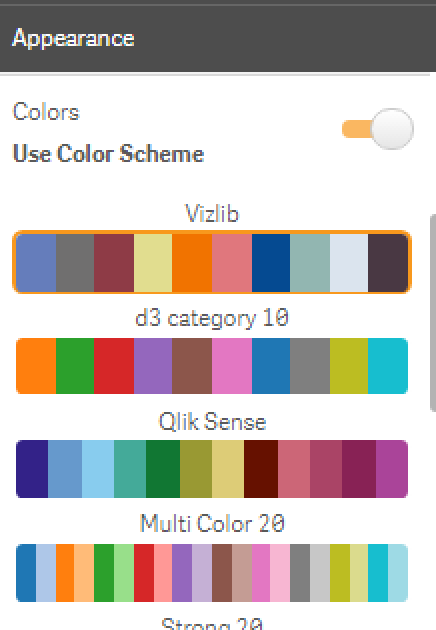 This is particularly useful when you wish to be consistent with your corporate colors, e.g.. Just specify a comma-separated list of hex-colors (#4477aa,#7db8da,#b6d7ea,...), and Vizlib Line Chart will loop through it and dynamically assign the colors to the lines. When a Color Scheme is utilized, you can reverse the order of colors by activating this checkbox. Ability to show or hide the legend. This only works if one metric is selected and a second dimension exists. Choose the font color of the legend. Pick the Font Size of the Legend Text. Interactivity enables the users to interact with the data in the chart as well as navigate throughout the line chart for a better view of the chart. Fixed rendering issue on IE. Added a new reference Object: Annotations, where an annotation with title/text can be added on a data point. 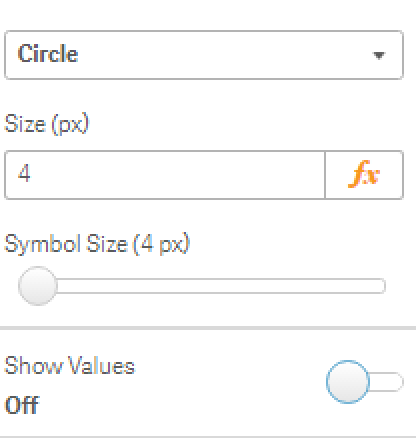 Fixed donut chart value labels where the label was not correctly showing the total. When time aware was used sometimes on the left/right axis some extra margin was added. Added stack mode in measures (independent per each axis). Dimension label was overlapping the axis in some occasions. 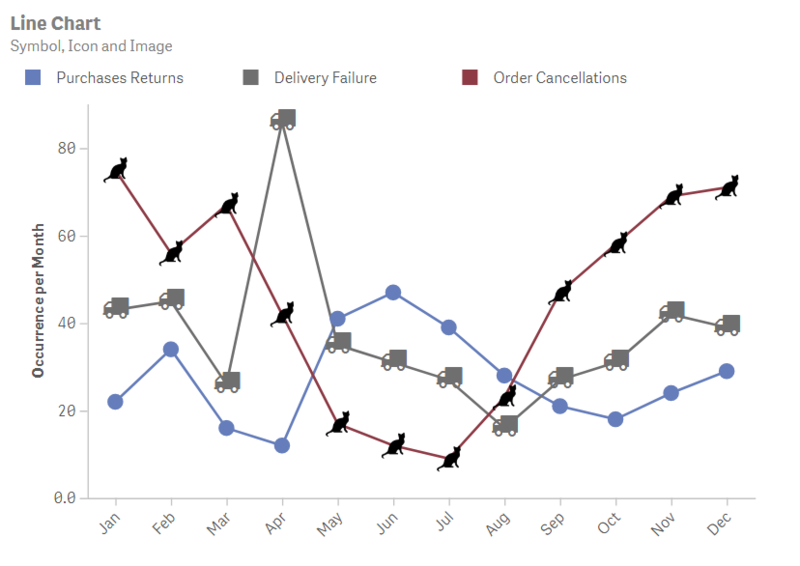 Fixed linechart pagination rendering issues when loading more than 2,500 data points. Fixed minor formatting issues on the secondary axis. Fixed number 'num()' formatting for measures. Added a new coloring mode 'by Segment'. Where the line/area can be split by value or line %, in order to multicolour the same measure. 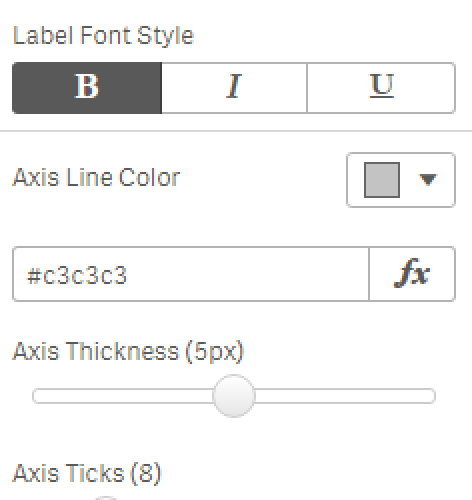 Add ability to conditionally change the icon and font size dynamically by expression. 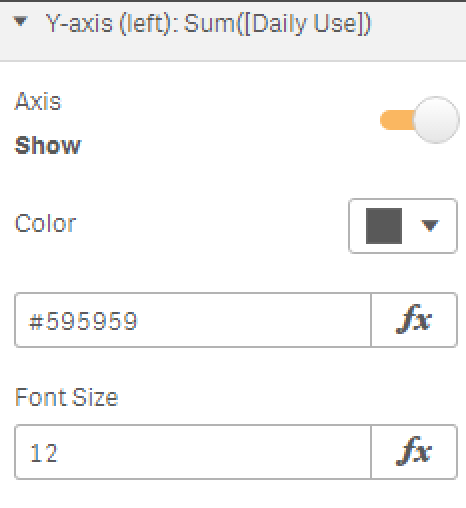 Add ability to conditionally apply opacity&color (line/data points/markers) by expression. Fixed minor number formatting issues. Tooltip was replacing spaces and other symbols with '_' on the tooltip labels. Tooltip has a smoother UX when hovering data points. Minor formatting bug fixes regarding the number formatting for the axis. Increased number of max allowed measures to 20. Fixed collisions with Scatter and Heatmap. 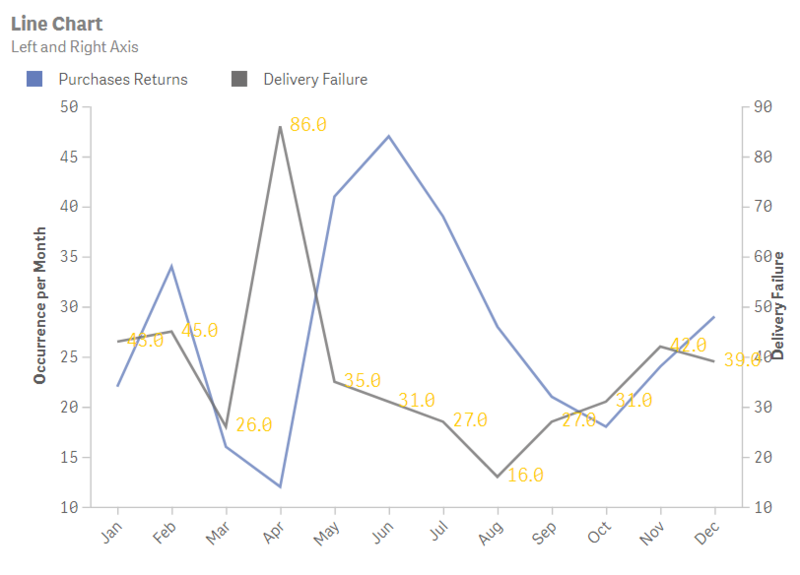 Opacity bug on the line chart when hovering. Conditional show & hide was not hiding the data labels. Fixed several bugs around the tooltip. Control the number of data points loaded and loading more than 10,000 records. Min/Max y/y2 values were in some cases not working as intended. Property panel was sometimes throwing API errors due to expressions format being required in some settings. Expressions have now been set as optional. Color picker for reference lines was not working. y2 axis tick was overlapping the dimension title. Sticky tooltip in single mode. High & lowlighting of lines were not working in IE - this has been fixed. 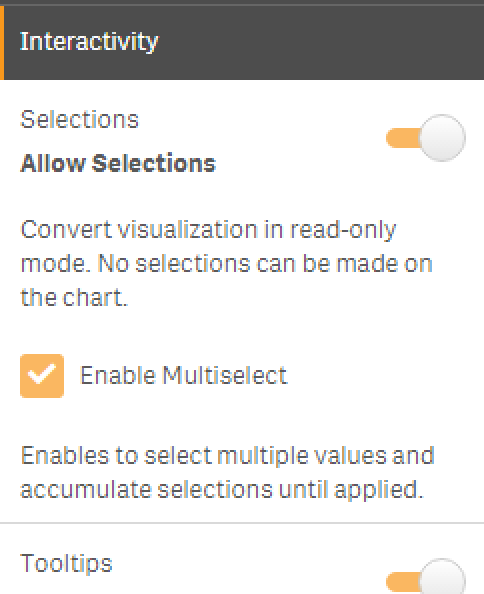 Single tooltip would cut-off when selecting data points near the chart borders. The tooltip will now be re-positioned if close to the edge. 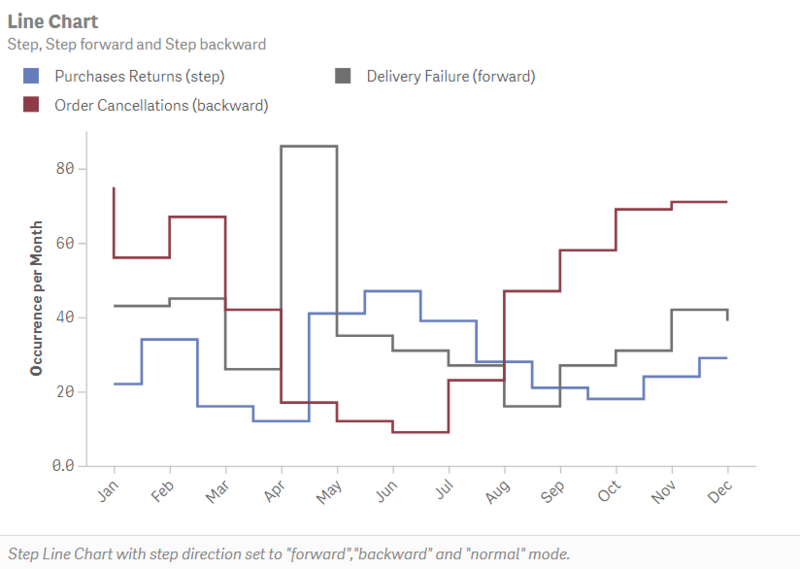 A metric consisting of null values only would break the chart - this has been fixed, and the line will disappear altogether. Pie & Donut mode is now working also when x-axis is time-aware. Reference line was breaking if decimal separator of its value was a comma (,). This has been fixed. 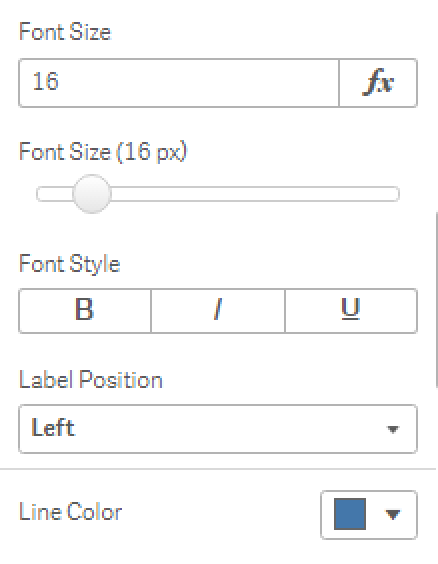 Ability to format the font size of the tooltip (single mode only). Ability to choose the line color of the trend lines. Highlight data points on hover. Highlighting can be deactivated in the property panel. Fixed issue where Vizlib Line Chart would not display on a mashup hosted on a server other than Qlik. Accumulate Values Settings would not appear checked even if the settings were active. Tooltip is now working in IE11 (single mode only). Horizontal Reference Line was not dynamically updating with selections. Fixed issue where trend lines would not disappear if deselected. Gradients doesn't work in QS Desktop due to limitation in the QS Desktop chrome browser.